Make your voice heard and stand up for the UN! The United Nations needs action from Americans now more than ever. In the midst of the worst refugee crisis since World War Two, with conflicts and pandemics threatening our own security, and millions around the world denied basic human rights on the basis of their gender, gender preference, or religion, this is no time for the US to back away from the UN. It is no time to go it alone. 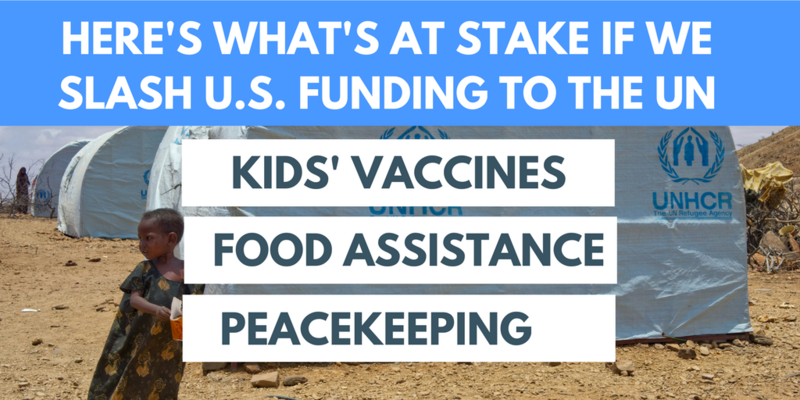 But U.S. funding for lifesaving programs is under threat like never before. From supporting peacekeeping missions in the toughest corners of the world to preventing the spread of violence, extremism, and infectious disease, to giving children a shot at an education through UNICEF, the UN advances America’s security as well as our values. UNA-USA is working with Americans across the nation to protect the vital work of the United Nations. We need you to act now! President Trump is expected to sign Executive Orders in the imminent future to drastically cut funding to the United Nations. These orders could also prevent the U.S. from supporting international treaties that affect several important American priorities, not the least of which is the Convention on the Elimination of All Forms of Discrimination Against Women (CEDAW).